I have actually had a little time in my 'girl cave' today! And I have loved every minute of it! Let me show you what I've accomplished! First, for Stamptacular Sunday Challenge, this cute little guy called to me! The challenge was to use SNOW someplace on our card for a "Snowtacular" challenge! The image & sentiment is TAC's "In the Snow" set. I used Tombow Markers, Sparkly Fluff, Stampin'Up's Bashful Blue (for the sky), and my Starburst Clear and Silver Glitter pens. Last, but absolutely NOT least, is this darling image from The Digi Kitty! In celebration of reaching 75 followers, The Digi Kitty posted this free, (yup FREE) digital image! This was just too much fun to pass up! If you haven't been to the Digi Kitty's site, you must make the trip - their images are just delightful! I did some paper piecing, and used a bit of glitter here and there, and I like the way it looks! The next view shows all of the layers that I used. I printed and cut out this image several times to make it really pop off the page! Here's how the card turned out! Used a Martha Stewart edge punch, scraps of DP, and the image/frame is from Inkadinkado. So...I hope that you saw something here today that gave you a smile! I feel like it's been forever since I sat at my work table. I'm now getting ready to being the dreadful monthly reports for DH's business, so I may be scarce for the next few days. If I don't get to your blogs, trust me, it's not because I wouldn't rather be blurfing than doing monthly reports...lol!!! 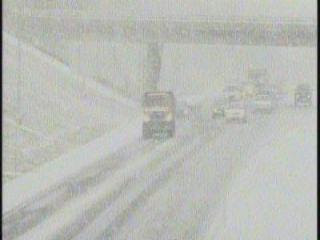 Before I get started, the above photo shows what we drove home in after taking DS to the airport this a.m.... the good news is that we only had to drive in it about 45-50 min. before it was clear! Well friends, it's the fourth 'Magical Monday' for me! I have enjoyed my time with There's Magic in the Air, as a Guest Designer for the month of December! Oh my, how quiet this house seems. DS has returned to California, and we probably won't see him again for quite some time. DD has returned to her place, and is leaving this week for a snowboarding trip to Colorado with a friend. It will be a very quiet week! Georgia commented on Sunday about how she gets sad when her kids leave. Our kids are 34 and 28, and I still cry when they leave, and mope for days afterwards. I am such a 'goodbye weenie'!!! Thank goodness for all of you! Well...I saw this little water image, and immediately thought of a Valentine's aquarium! What a perfect image for a shadowbox card! It's colored with colored pencils, and I've used Glossy Accents to create the shiny look on the water and greenery. The bubbles are Rain Dots. The sentiment is a retired stamp from The Angel Company. Have a wonderful Magical Monday! Be sure to run over to There's Magic in the Air, grab your own FREE image, and create something wonderful to enter in the weekly contest! This will be an extremely short post - We have to have DS to the airport tomorrow (1.5 hrs. away) by 7 a.m., so it's early to bed for us! I made this card following the Stampin' Sisters in Christ Sketch 18. Below is the sketch and the card. Stamps are TAC, coloring is done with Stampin' Up and Tombow markers. Embellished with Starburst Glitter Pen. I'll be back on Monday with my 4th Magical Monday card! The challenge this week at House Mouse is brought to us by DT member, Lori. The challenge is to use the theme: "Winter Wishes". Well, I don't know about you, but, following all of the rush of the holiday season, all I ever wish for after Christmas is a NAP!!! Look at these little cuties - all settled in for their long winter's nap! The perfect image to use this week! CS is DCWV, and the DP is from a recycled paper pad from K and Company. The pom pom is made with Sparkle Fluff! We have a houseguest this week... a lady that works with DD was flying home to Witchita, Ks. for the holidays, and had no place to go with her 'pup'. Meet Chakota - our Christmas houseguest! (She moved, and the photo is blurry...) She is SO timid - scared to death of everyone and everything. She's finally warmed up (REALLY warmed up) to me, but jumps a foot off the floor when the furnace kicks on, or the phone rings. She's "almost" housetrained, so needless to say, I've already cleaned up one mess today. Hopefully, after she's here another day, she'll fit right in! Her 'momma' is coming home on the evening of the 26th, and I'm sure Chakota will be happy to see her! Last, but certainly not least, here are a couple of photo's of our Nativity Scene. This is always the very first thing to go up, actually going up a week or so before any other decorations. As I gently unbox and place each piece, I quietly pray for friends, family members, military troops and their families, and many other things. I feel like this always starts our holiday season off with a feeling of peace and love. There are also a couple of photo's of our blurry tree - just could NOT get it to photograph well. It's very pretty, nearly touches the ceiling - we actually had to bend the top down for the angel to sit on top. We've had a real tree for years and years, but last winter, we had some family crisis, and ended up needing to put up a tree quite literally at the last minute, so DH brought this one in - I thought he really did a good job of 'tree shopping'!!! Our home is not fancy or large, but it is home, and we will probably be here until we are carried out in a pine box! We have raised the kids here, and the memories are so special to us! Food for thought: If you were paid five cents for every kind word you spoke or thought, or were charged five cents for every unkind word or thought... would you be rich or poor? This card is for my third Magical Monday for Nina at "There's Magic in the Air". Meet Merry Moose! He was SO much fun to color! Every Monday morning, Nina posts a new digi image on the TMITA blog for you to create with. You can then enter your creation in a weekly contest to win prizes! DT member, Danielle, issued a sketch challenge for this week! Here is Danielle's awesome sketch, followed by my card! 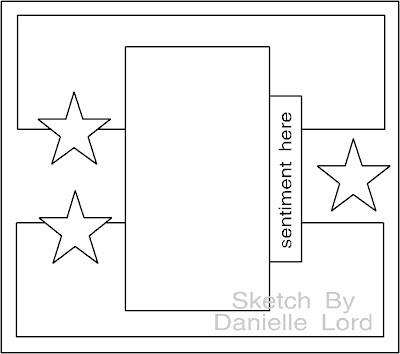 I actually (almost) stayed true to the sketch, even using stars where Danielle had stars! However, this is an A2 card, not a square card! Hope you like it - isn't he the most adorable Moose??? Don't leave yet!!! I had so much fun with Merry Moose, that I made an easel card as well. Here is my easel card. I took a side shot so that you could see all of the layers are different heights. The two outside trees are adhered flat to the card. The inside tree is raised up with one set of dimensional dots, and Merry Moose is raised up with two sets. Hope you like this one too! Nina's store is open! Be sure to stop by and check out ALL of her amazing images! Just click on the link below to begin shopping for your own collection! Thanks for stopping by! - Have a wonderful day! I am also entering this at Rosie-Dee's Challenge, which is Rudolph! Always keep your words soft and tender, for tomorrow, you may have to eat them! How much fun it was last week when I went to the Stampin' Sisters in Christ blog to check out the beautiful work of their design team, and their top cards of the week. There was this card by Joey, that made me literally smile out loud! Before I go on with my long winded story, be sure to go to Joey's blog and look around! What a cute blog to visit!!! So... years ago, I was in the process of looking for T-Shirts for some of us at work. I found a little thumbnail sized photo on a T-Shirt, and just fell in love with it. I printed it out (in thumbnail size - it was protected! ), brought it home, taped it up on the wall in our sunroom, and painted it on the wall! The kids have teased me unmercifully, as I somehow gave the angel six digits on one hand!!! Anyway, below is our sunroom! Now you know why I smiled out loud! Don't you just adore Joey's card? And isn't my wall just too much fun? Everyone needs a six digited angel, don't you think??? Back tomorrow with the cutest digi image from There's Magic in the Air!!! Just a little something that I received from a friend today, that I wanted to share with all of you. This is a time when things are so rushed, that I thought a little piece of 'peace' would maybe give you a smile! I've never tried to link up something like this before, so I hope it works! Be sure your volume is on! Good morning! I haven't wanted to whine in public, so only a few of you know that I've had the creepin' crud this week! However, I woke up this a.m. able to breathe again through my nose!!! Amazing how little it takes to make me happy - breathing is good! This card is one that I made for Selma's challenge at StampTV this week. The challenge is "Blast from the Past". Every Friday, Selma will focus on one of Gina's past video's and challenges. This weeks challenge was 'partial embossing'. I used Gina's Pure Luxury Ivory CS, the Cuttlebut Dotted Swiss Embossing Folder, my Scor-Pal, and Theresa Momber's set "Very Merry Christmas". This next project is a gift bag that I made for a recent Gift Bag Swap. I cut down a lunch bag, and covered the front and back. The Ornamental Joy stamp is from The Angel Company. The slot-punch is from Stampin' Up. I received some gorgeous bags in the swap - maybe I will showcase them tomorrow! It's so much fun to glitz up a plain bag! Well, so far, we have been very lucky. It's been cold, wet, and windy here, but we've had no ice, and no snow. How about all of you? Today's adventure will be to go to the store for 'necessities'. I haven't ventured out since the weekend, but today, I have no choice! There are things that I must have! Hope that you have a wonderful day! Food for thought: Slow down and enjoy the season! The Lord didn't do it all in one day - what makes you think you can??? There was this incredible blog hop over at There's Magic in the Air last week. I was lucky enough to be a part of it! 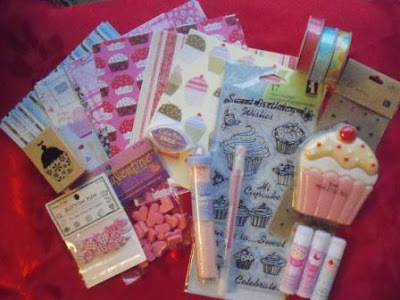 When I posted my project of gift bags and candy boxes, I decided to give the project away to one lucky winner. and drew one name out. Here is the lucky winner of my project! Yikes, Roberta, I hope that you meant to say that you would definitely try my recipe, not defiantly... Lolololololol.....gotta love it - sounds like something I would say! When you get arount to trying the recipe, be sure to let me know how you like it! Roberta, please drop me a line via e-mail, and let me know what your mailing address is, and I will get this shipped out to you tomorrow! 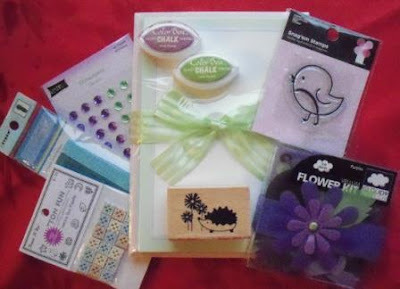 Thanks so much for being a follower of my blog, and for participating in the blog hop at TMITA last week! Today is my second Monday as Guest Designer for Nina at "There's Magic in the Air". 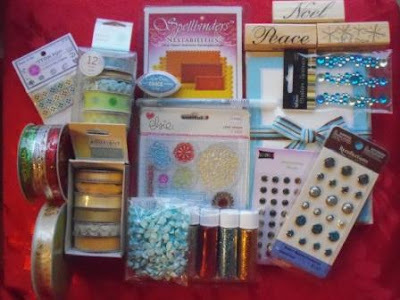 Our challenge this week, from Selma, was to use Nina's beautiful Christmas Arrangement image, and to Glitz it Up, using glitter or stickles on our projects. As it is mid-December, and I am in the midst of decorating for the holidays, I chose to add some lights to a clear glass block, and decorate it with Nina's beautiful image. The image was colored with colored pencils and low odor mineral spirits, and embellished with Sakura Glitter Pens, Stickles, and some pretty gold ribbon that I found at JoAnn's a few weeks ago. The background paper is from Basic Grey's Eskimo Kisses Collection. Head on over to TMITA to get your own FREE image - we'd love to see you enter this week's challenge! Be sure to check out Nina's new store! It's open, and it's fabulous! Click on the link below to see her wonderful images! I'll be back tomorrow with your winner of last week's project! Food for thought: You know you're getting older when you get the same sensation from your rocking chair that you used to get from a roller coaster!!! There's Magic in the Air with Paper Cupcakes Recipe Blog Hop! Nina's wonderful design that I used, is called "Owls on Candy Cane". All images were colored using colored pencils and mineral spirits. Glossy Accents were used to shine the candy up a bit! My gift set includes one large and one small gift bag, one large flip top candy box, one small pizza box full of candy, and a clamshell box full of gift tags! The sentiment on the Kraft bag says: "There's Magic in the Air! Happy Holidays". In a small pan, toast 1/2 cup of coconut and 1/2 cup of pecan pieces. Be sure to stir and 'toss' to avoid burning. When toasted, set aside. Prepare a graham cracker crust in 9 x 13 x 2 pan. In large mixing bowl, blend together 1 large and 1 small container of Cool Whip, 8 oz. Cream Cheese, and 1 can Eagle Brand Sweetened Condensed milk. When blended pour into crust. Sprinkle coconut and pecan topping over filling. Drizzle top with Caramel and/or Chocolate Ice Cream Topping. Cover and freeze until ready to eat. Note: You can use all low-fat ingredients for a healthier treat! If you arrived on my blog first, you need to go to the beginning of the hop HERE, to get all of the directions, and to begin collecting clues. If you arrived here from Kim's blog, then you are on the right path! Remember to leave a comment on my blog! and collect your next clue! P.S. In addition to all of Nina's fabulous prizes, on Monday, I will randomly choose a winner from those who comment here. That winner will receive the gift set you see here! Good luck everyone! Brrr...it is cold, it is raining, and it might freeze! What better timing to be sitting at your computer with a cup of coffee, or cocoa, and doing a Recipe Blog Hop with us!!!??? Please remember to join us December 9th - 13th for the Recipe Blog Hop at There's Magic in the Air with Paper Cupcakes! We hope to see you bright and early tomorrow morning! 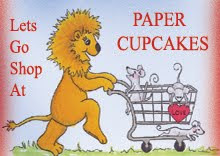 Be sure to start at There's Magic in the Air with Paper Cupcakes! You will get directions for 'The Hop' there!!! I'm off to my first Christmas Party with my stamping buddies!!! Good food, good company, good times! I am so excited to be the December Guest Designer for Nina at "There's Magic in the Air"! What a blessing to be here working with such a talented group of people! I am spending a lot of time pinching myself! For my first project, I am using Nina's adorable "Sweet Trouble" image. We were all given a photo of Kim's sweet little pup, Malie, for inspiration. Kim's challenge for us was to make a clean and simple card, using no brads, buttons, bows, or anything else that might make it challenging to mail. Of course, a color requirement of PINK must appear on our card as well! I paper pieced Sweet Trouble's body, clothing, and the candy cane holder with scraps from my stash. The ribbon, bow, candy canes, and dots on the scalloped edge were colored with a red Sharpie. Glossy Accents finished the candy canes, bow, and ribbon. I used some white Fun Flock for the fur on this cute little guys hat, and for the snow. The sponging was done with TAC's Ballet Blue. Be sure to go to "There's Magic in the Air" to get this FREE and adorable image for your own! Create your project using this image, and enter it in Nina's weekly challenge. You could be the lucky winner! I can't wait to see YOUR creation! Before you leave, click on the link on my sidebar to check out the upcoming Blog Hop at "There's Magic in the Air", as well!